Oh no. Now I’m really starting to get alarmed. Trader Joe’s has innaugarated this year’s Pumpkin Madness in a big way – with the introduction of a brand new type of cookie butter – Trader Joe’s Pumpkin Spiced Cookie Butter. What it is: Cookie butter that tastes like pumpkin pie. Price: $3.99 for a 14.1 oz jar. Worth it: Yes – it’s cookie butter. Look, on the one hand this is nothing if not welcome news. Any time Trader Joe’s wants to expand their absolutely heavenly line of cookie butter products is fine by me. Previous entries include Trader Joe’s Crunchy Cookie Butter, Trader Joe’s Cookie Butter and Nutella, Trader Joe’s Oreo-based Cookies and Creme Cookie Butter, not to mention all the countless offshoots and ancillary confections made with that tongue-melting, heart-stopping emulsified cookie sweetness. 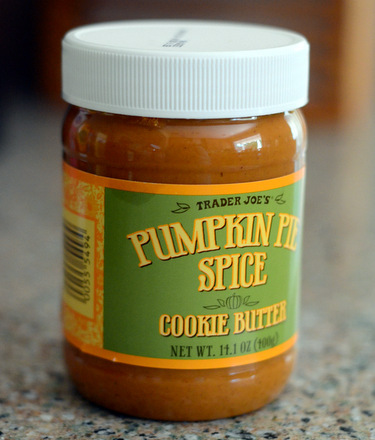 In certain ways, Trader Joe’s Pumpkin Spiced Cookie Butter is the most radical new member to the family. Here, for the first time ever, do we have a cookie butter not actually based on any real cookie. This is a huge move, on par with the introduction of the Cookies and Creme cookie butter. That Oreo-based cookie butter excited me because it suggested Trader Joe’s would start introducing new cookie butters based on entirely different types of cookies, not just the gold standard speculoos cookie. Pumpkin Pie Spice Cookie Butter takes it one step further, throwing the doors open to any sort of spice or confection imaginable. This terrifies me slightly – in the same way that staring into the unshielded face of God himself would terrify me. Trader Joe’s has essentially taken us all one huge step closer to just selling us frosting as a sandwich spread. The Cookies and Creme cookie butter was close enough already – without cookies in the equation, there’s nothing holding them back. Give it a few more years, and we’ll be seeing Trader Joe’s Tahitian Vanilla “Cookie Butter” spread, that’s nothing more than a screw-top jar of creamy delicious frosting that we’ll all have been Pavlovian conditioned eat straight from the jar. Is that the dystopia or utopia? Or maybe I’m just getting over excited. In any case, this is a delicious new entry into the cookie butter family. 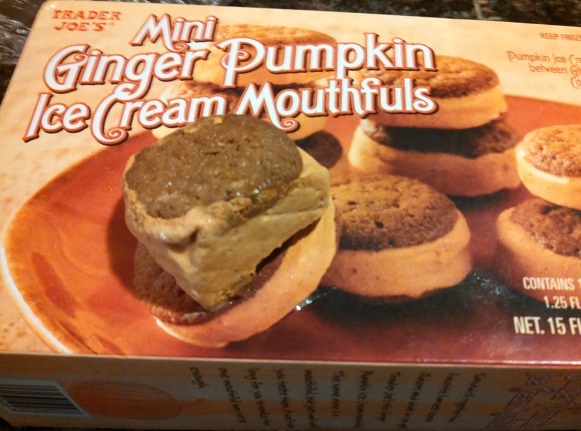 It tastes just like you hope a pumpkin pie spice cookie butter would taste. A sweet hint of pumpkin is the first taste that will hits your tongue, as well as the lingering aftertaste. In between, you’ll be treated to a gooey, nuanced mix of cookie bits, with pumpkin puree, pumpkin powder, cinnamon, nutmeg, ginger, allspice, and cloves. 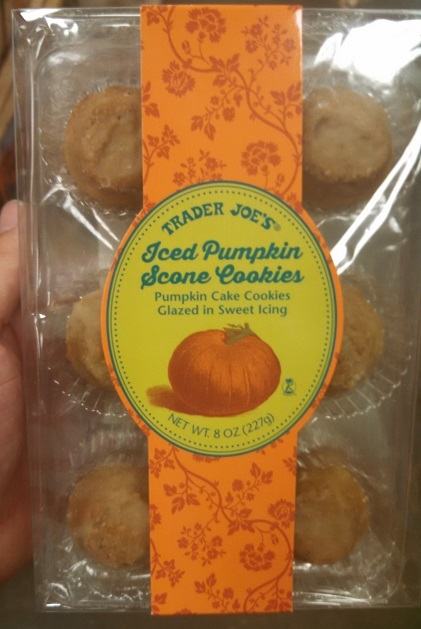 Instead of speculoos cookies this time around, Trader Joe’s makes use of some sort of pumpkin, sugar cookie crumbs. These cookie crumbs are made with pumpkin puree and organic pumpkin powder, but they’re much too small to really get a taste of. This forms the basis for the crunchy bits of cookie crumb in the mix (more like crunchy cookie butter than the creamy kind), but it’s actually the least delicious part. Far more interesting are the complex notes of the pumpkin pie spices, and the enduring pumpkin flavor, all of which are captured in excellent clarity. Like all other types of cookie butter, the biggest question is, “What do you actually do with this stuff?” The most obvious answer is “just spoon it straight into your face”, but for those of us who try to maintain a bit of decorum, it’s also great on waffle, pancakes and even in peanut butter sandwiches. It can also work as a seasonal dip for pretzels, apples or even celery. Another big question – is Trader Joe’s Pumpkin Pie Spice Cookie Butter actually any better than Trader Joe’s regular cookie butter? Once again, I have to say that while this is interesting addition and delicious in its own right, it still doesn’t dethrone our glorious reigning king, the original cookie butter. 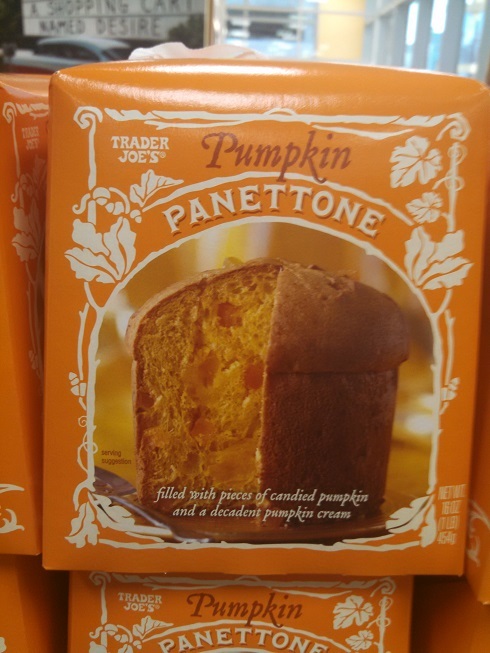 Nevertheless, it’s a welcome addtion to my patry this autumn and, a seasonal treat to be looked forward to like egg nog or Halloween candy. Here’s hoping it returns again next year. Would I Recommend It: It’s cookie butter, so yeah. 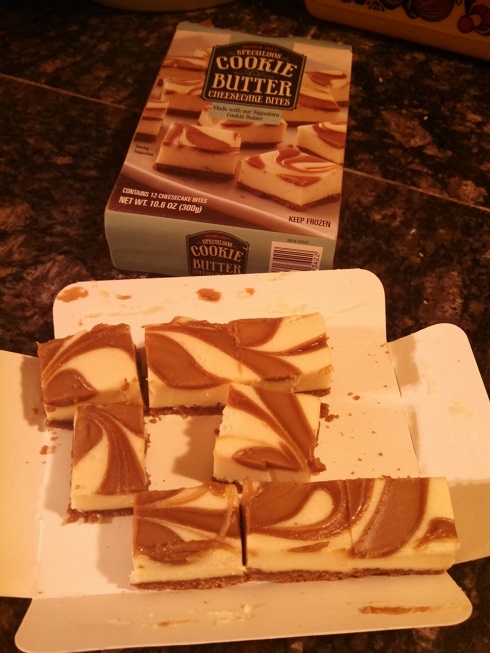 Would I Buy It Again: I have, like, three different cookie butters in my cabinet right now. Of course I will. 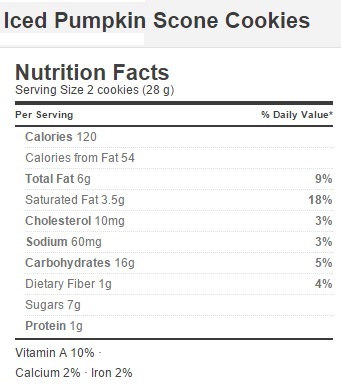 Final Synopsis: Pumpkin cookie based cookie butter, with plenty of pumpkin spices. Quick question, what’s the best part about brownies? The warm, chewy, goo-aliciousness, right? The chocolate is good, but if I was just interested in chocolate I’d be eating a chocolate bar or having a piece of fudge. Worth it: No. Not at all. No sir, when I go after a brownie, it’s for the distinct, almost startling clear, sensory image of biting into a warm, chewy and, yes, goo-alicious square of melted bliss. And also sometimes to get high – but that’s a different issue entirely and completely legal in many states. 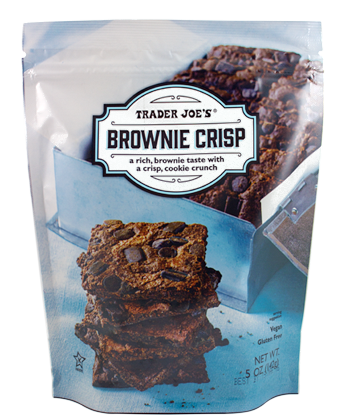 Trader Joe’s Brownie Crisps, then, are not just a disappointment but a failure of brownie-kind. Although brownies are promised what you actually receive are thin, hard, dry, brittle squares of brown cookie. These are like brownies in so far as a pop-tart is like a fresh raspberry torte. All of that ooey-gooey goodness is no where to be found, and in its place is nothing worthwhile or redeeming. Even if taken just as a cookie, these Brownie Crisps notably hard and dry. I’ve had chocolate chip cookies from a vending machine with more life than these. These brownie “cookies” are, essentially, very badly over baked brownies. If I forgot I had some brownies in the oven and came back to find them absolutely parched and glued to the bottom of the pan, I’d throw them out. I most definitely wouldn’t chisel them out, package them and try and sell them to people. Frankly, I over-cook brownies enough on my own time. If I wanted that experience, I’m free to pick up some of Trader Joe’s brownie mixes (such as their quick-bake or reduced guilt mixes) and go to town. For a pre-made brownie/cookie product I expect something a little better. They look especially lackluster coming, as they do, right on the heels of the actually delicious tea cookies I reviewed previously. I’m kind of at a loss for what to do about these. Wasting food is something I almost never do – but I couldn’t interest anyone in taking a second bite, and I certainly am not going to be eating them myself. Would I Recommend Them: Only if I wanted to disappoint someone. Would I Buy Them Again: Definitely not. Final Synopsis: Failure as a cookie. Failure as a brownie. Man, doesn’t that look delicious? How could that not be delicious? 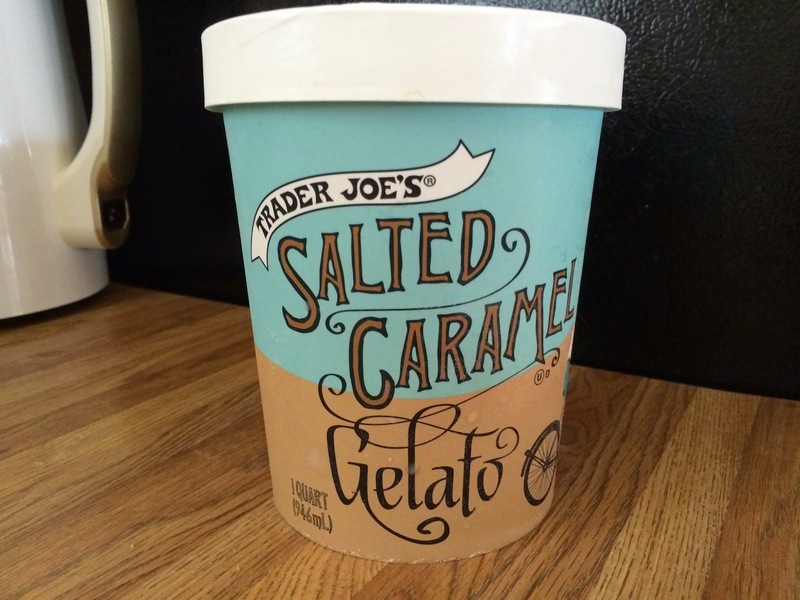 Oh, what a disappointment you are Trader Joe’s Salted Caramel Gelato. Trader Joe’s has brought so many wonderful things into my life, I try and not get too let down when something falls flat. They dream big, and for that, at the very least, they deserves our every consideration of leniency. And yet I am simply crushed by overwhelmingly lackluster execution of what could have been a mouth-melting delight. Deserts, like everything else in life, can be broken down into closely detailed hierarchy of what-beats-what (this is the sort of thing usually done by bored nerds. For instance, me, right now). The way I see it, frozen deserts generally beat baked deserts (ice cream beats cake). Within the domain of frozen treats, we have ice cream at the bottom, then sherbet, then sorbet, and finally, at the very top, theoretically you have your gelato. Unfortunately, what we have here is a failure of gelato. What I look for in a good gelato is something creamy, dense and bursting with rich, overwhelming flavor. For something like salted caramel it seems like this should be a grand slam. Salted caramel, so simple but under-appreciated for so long, is one of the most satisfying flavors on the market. When it comes to intense, tongue pleasing tastes, there are ways to get fancier with it (and ice cream makers certainly twist themselves in knots coming out with convoluted, over-the-top flavors), but you just can’t beat the simple blast of savory and sweet you get from a well executed salted caramel. 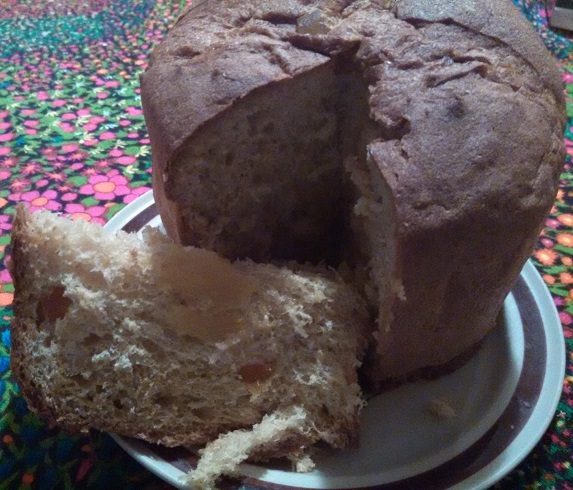 My tongue tingles just thinking about that rich buttery sugar melting into flashes of brilliant salty bursts. 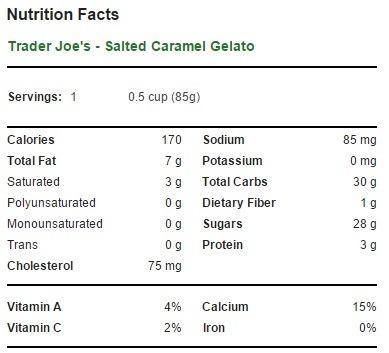 This is the first gelato Trader Joe’s has ever brought to market, and it makes sense to choose such a decadent flavor – so why does Trader Joe’s Salted Caramel Gelato fail so badly? Mainly, there really isn’t anything interesting going on here. The gelato is creamy, but lightweight – more like a scoop of Rite Aid Thrifty brand vanilla than a premium ice cream experience. This wouldn’t be such a failure if the gelato itself was as rich, sweet or salty as you might expect it to be. Instead of being blasted by a tongue-grabbing saltiness or charmed by impossibly sweet and creamy custard, you’re presented with a blandly “meh” sort of middle of the road flavor. Less creamy than their vanilla, less sweet and savory than their cookie butter ice cream, there’s no reason to come back to this mediocre confection. In fact, Trader Joe’s has a plethora of delectable ice cream treats to choose from. Despite the name on this bucket, don’t expect it to beat out any of the other ones. I’d buy much more likely to buy another half gallon of Trader Joe’s Soy Creamy Frozen Desert before I bought more of this – not just because it’d be healthier, but because the vegan soy milk is at least doing something interesting with flavor. Would I Recommend It: No way – go for the Cookie Butter ice cream first. Would I Buy It Again: Not so long as I have any other choice. Final Synopsis: “Salted” “Caramel” “Gelato” that fails to live up to any part of the name.